My father, James E. Conway came to the Mallee about the beginning of the 1900's and bought a block of land 7 miles north of Ultima, a place called "Gowan" in later years called "Gowanford." The farm had to be cleared of Mallee trees before being able to sow the wheat and oats. The oats were cut for horse feed. The chaff cutter had a horse powered machine. 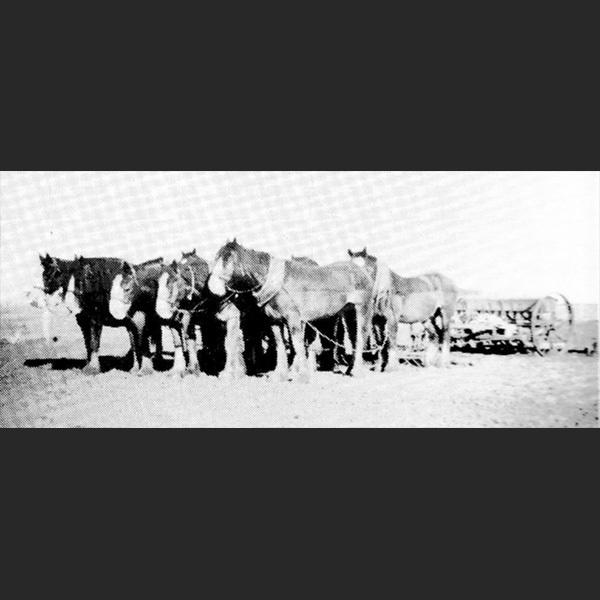 Water for the stock had to be carted from Swan Hill in tanks with wagon and horses. A small house was built on the farm. Later water was channelled from down south and filled the dams which had been sunk on the farms. Then when a windmill was erected, the water was piped up to the house. In 1910 he married Mary M. Burns who came from the Wycheproof district, and they had a family of 6 girls and 1 boy. Then when it came time for schooling, he worked hard to get a school built. Eventually it was built in the corner of one of his paddocks near the railway siding. Mother boarded teachers and helped with anything to do with schooling. She worked very hard, feeding animals, milking cows, making butter etc. also had chooks for eggs, and made the children's clothes as well. All the family had their schooling up to the 8th Grade at Gowan School, also a grandson had his schooling there. The horse and gig or buggy and pair of horses were their means of transport, until later when a car and tractor replaced the horses. There were some good years as well as drought, dust storms and mice plagues. Later my brother Vincent worked the farm and farmed until a few years ago when he sold out and resided in Ultima.